If you’ve traveled abroad lately and used a credit card (or even if you’ve just charged something from a company outside the US on PayPal) you’ve probably noticed the increasing prevalence of something called “dynamic currency conversion.” Basically, instead of just charging the amount in Euros or pounds or whatever currency the purchase is in, merchants give you the choice of “paying in dollars” and will show you the amount you will owe. While it may seem like a cool convenience in an increasingly complicated world where currency values fluctuate from hour to hour and day to day, as TPG contributor Nick Ewen details, dynamic currency conversion is just another added fee to the cost of traveling abroad – sort of like paying an exchange fee for changing your money – and should be avoided whenever possible. Here is what he found. Always choose to pay in local currency. 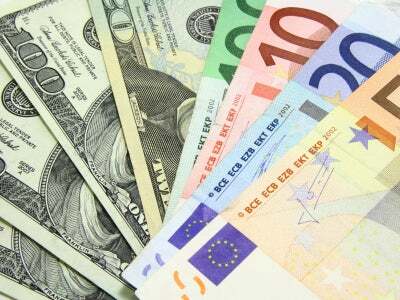 Dynamic currency conversion is an aspect of the international currency market that is relatively new and masquerades as an easy way to pay more for goods and services abroad. In essence, it capitalizes on the fears and ignorance of a casual traveler that they do not know just how much of their own currency they are spending. More and more, when you are out of the country and use a credit card to charge a purchase – anything from clothes or a meal to hotel rooms, you are asked whether you want to be charged in US dollars or the local currency. Paying in dollars is almost always a bad deal, though, so always choose the local currency. In doing so, you avoid the pitfalls of the phenomenon (and money-making scheme) known as dynamic currency conversion. The only real benefit to dynamic currency conversion is that it allows a customer to immediately see how much their transaction will cost in their home currency rather than estimating or trying to do the math on the spot. If you accept that option, however, you’re in for a rude awakening when your credit card bill arrives because these transactions inevitably tack on additional fees. The additional fees can be as low as 1%, but they could wind up tacking on as much as 7% of the purchase price! Much of this goes directly into the seller’s pocket, and in fact, many companies that provide this service for merchants even tout the additional commissions in their promotional materials (see CyberSource’s Dynamic Currency Conversion resource) when selling them to merchants. CyberSource’s materials even go so far as to say: “Plus, you can generate a new revenue stream – you earn commissions every time a customer selects DCC. This revenue can be used to offset the cost of acquiring foreign transactions.” It’s literally just a money-making scheme dressed up as an excuse for merchants to shift credit card processing charges onto consumers. Here’s an example of how this might work. Let’s say you book a vacation to Iceland after being inspired by TPG and Eric’s recent trip. While shopping along the streets of Reykjavík, you find a great souvenir priced at ISK 12,000. However, the merchant may ask if you would like to pay in dollars, and quote you a price of $105. You quickly try to do the math, but you’re tired from the overnight flight and decide to just do it. You pay with a no foreign transaction fee credit card, but you just unwittingly spent more than you should have spent. If you had elected to pay in ISK, that purchase would cost $99.13 (exchange rates as of the time of writing). Instead, you spent an extra $5.87, a mark-up of almost 6%. 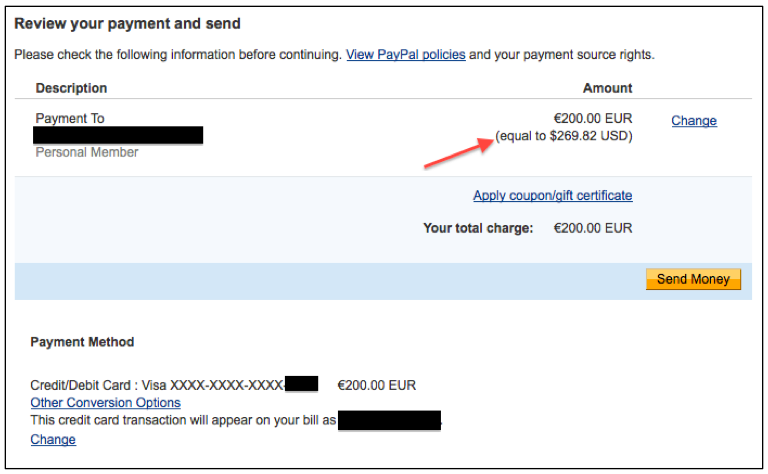 You’ll notice that PayPal has calculated the amount you will send using the exchange rate of $1 = 0.741238€. Here’s the problem: that rate is lower than the current exchange rate! 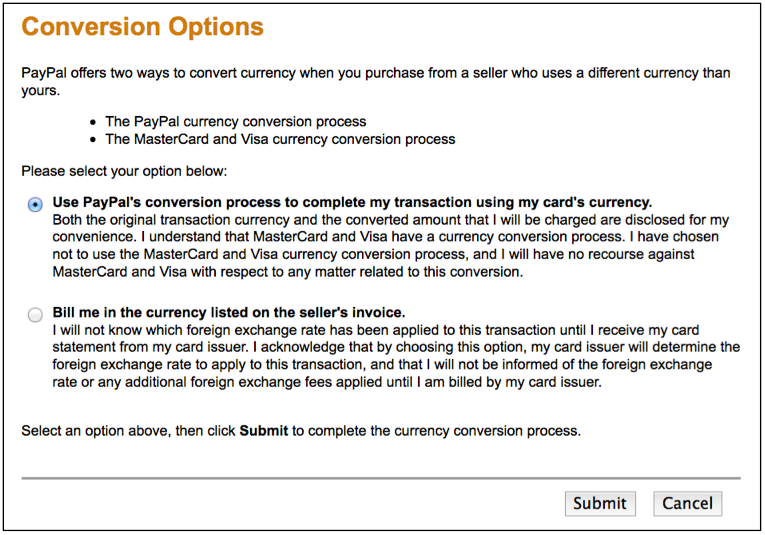 In addition to the PayPal rate, there is another option: to be billed in the currency of the seller. With this option, your card issuer makes the conversion, and it will always be at a better rate. However, this is not the case. When you select to be billed in the currency of the seller, your credit/debit card network will automatically convert the currency using the prevailing exchange rate, not PayPal’s conversion rate. 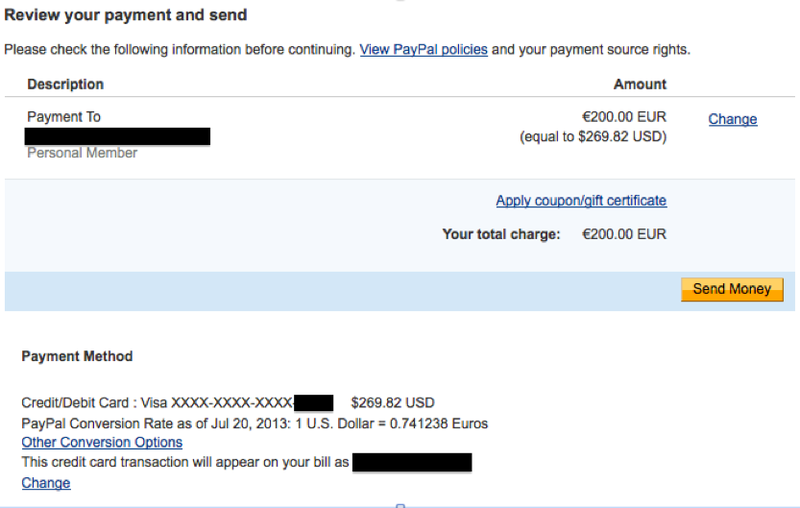 By electing the network conversion rather than PayPal’s rate, I was able to save $6.08, or approximately 2.5%. Even though the site told me I would be charged the higher amount, Visa converted the 180€ using their own (much more favorable) exchange rate. One interesting way to see this in action is to download a currency conversion app on your smartphone (my personal favorite is the free one from XE). 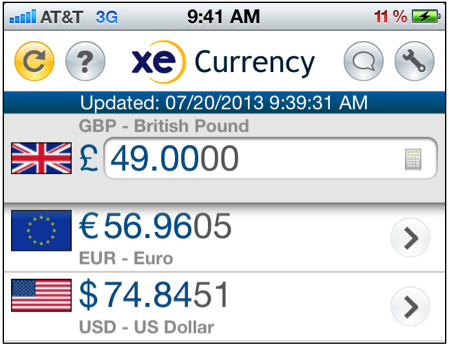 With XE, you can input up to 10 currencies and pull current market exchange rates (when connected to WiFi or a cell network, of course). The app then stores these settings so you can immediately evaluate a transaction when you are out and about and no longer connected to the Internet. Just type in the amount of the foreign currency and the app will calculate the cost in dollars (or any other currency). Much easier than trying to do the math on the spot. The quote will almost certainly be more than $74.85 (my guess would be somewhere in the neighborhood of $77). Then, politely ask to be charged in pounds, use a card with no foreign transaction fees, and walk out of the shop as an informed consumer, satisfied that you just outsmarted the dynamic currency conversion trap. The bottom line is, Dynamic Currency Conversion is good for merchants but not consumers, so though it’s nice to know how much a charge will show up as on your credit card statement in your own currency ahead of time, it’s not so nice when it’s 2-7% higher than what it would be if you’d just made the charge in the foreign currency of the country you’re visiting. Essentially you’re wiping out any savings from using a card that doesn’t incur foreign transaction fees, so just say no. I’d love to hear your personal experiences with this, so please feel free to share them in the comments section below.